Congratulations to all of the MCHS Newberry County Exchange Club Students of the Month: John Chandler Dickert, Jalen “Jack” Edwards, Elizabeth Riley Eldridge, Megan Grubbs, Elise Mills, and Will Murray. The Exchange Club Youth of the Year meeting was held on Tuesday, April 2. 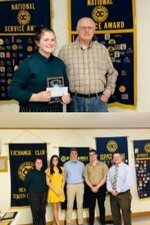 Congratulations to Elizabeth Riley Eldridge for being chosen as the MCHS Newberry County Exchange Club Youth of the Year for 2018-2019. All of these students have and continue to represent MCHS with integrity and pride.